If a nickname has the word “lobster” in it, you know it’s going to be big. So it is for the Lord Howe Island stick insect, affectionately known as the “tree lobster.” Once so plentiful in the forested areas of Lord Howe Island, located several miles off the coast of Australia, that fishermen used them as bait, sightings of these stick insects declined precipitously—and by the early 1930s, they were presumed extinct. Their fall occurred after black rats infested their remote volcanic habitat in 1918 and devoured them. Twelve other invertebrate species and five bird species were also exterminated due to the rats. But there were rumors that the big, black bug was living on Ball’s Pyramid, a tiny, sheer-faced volcanic “sea stack” about 12 miles (20 km) from Lord Howe Island. Could it be true? Intrepid scientists traveled to the treacherous pyramid in 2001 to “make sure” they were gone. They were astonished to find a tiny population of the insects surviving on one lone, scruffy shrub, clinging to life on a 60 degree slope of the barren rock. Upon the insect’s “rediscovery,” two breeding pairs were brought to the Australian mainland for breeding; a few other zoos, including San Diego, are now also participating in resurrecting the rarest insect on the planet. The Lord Howe Island stick insect is a large, flightless, nocturnal insect that can grow the length of an adult human’s hand. It has a stout body—females have a broad abdomen with an ovipositor while males are more slender but have longer and thicker antennae and enlarged hind legs. Juveniles, called nymphs, are bright green for the first few months of life and active during the day; adults are a dark, glossy brown-black. Another name for a stick insect is phasmid. Lord Howe Island stick insects are endemic to the Lord Howe Island Group, a cluster of volcanic islands in a crescent shape in the Tasman Sea between Australia and New Zealand. Today, a tiny population survives on Ball’s Pyramid, a steep, tiny volcanic “sea stack” about 12 miles southeast of the main Lord Howe Island. These animals are the founders of the zoo-based species recovery programs. Ball’s Pyramid is the tallest volcanic sea stack in the world at 1,844 feet (562 meters) high. It is about 3,600 feet (1,100 meters) long and 980 feet (300 meters) across. Little grows here, but a single patch of a spindly melaleuca bush Melaleuca howeana that manages to eke out a living in a tiny plot of soil is the lifeblood of the Lord Howe Island stick insect! The entire habitat is at the mercy of the sea and endures blistering heat during the day, storms, and strong winds. The insects shelter in cavities formed in plant debris or at the base of the shrubs on Ball’s Pyramid. With the absence of rats on Ball’s Pyramid, the tiny population living there is as safe as it can be, especially since access to the island is severely restricted. Back on Lord Howe Island, people are working on eradicating the rogue rodents, so the Lord Howe Island stick insect can be reintroduced and once again reign over its historic domain after almost a century of exile. On Ball's Pyramid, adult Lord Howe Island stick insects spend the night nibbling on leaf tips of the melaleuca bush, and then retreat out of sight by day. At the San Diego Zoo, melaleuca and Moreton Bay fig plants are being cultivated to provide sustenance for the growing population in managed care. Adult insects huddle together as they shelter from predators during the day, with dozens of animals found in one tree hollow or hide. This species is capable of reproducing asexually by parthenogenesis, where unfertilized eggs hatch into females, a common reproductive strategy among phasmids (stick insects). On Ball’s Pyramid, the 2007 surveys of the wild population showed that the population was skewed more toward females than males. Observations from the captive breeding program at the Melbourne Zoo indicate that females bury their eggs in the soil. Additionally, mating in the species is reported to occur up to three times per night (they are nocturnal) at up to 20 minutes per session. The female lays eggs in the soil and covers them, using her abdomen to bury them. The eggs are beige and adorned with raised, reticulated patterns. Each female can produce up to 300 eggs over her lifetime. The nymphs molt as they grow, shedding their outer exoskeleton and becoming darker in color until they reach adulthood at about seven months of age. The San Diego Zoo is working with Australia’s Melbourne Zoo to breed Lord Howe Island stick insects. Our entomology department received 300 eggs from them, which began hatching in February 2016. The nymphs appear to be munching on the same plants the insects eat at the Melbourne Zoo, grown from clippings and seed brought back from Australia by a San Diego Zoo horticulturist. Once the breeding program is established, Lord Howe Island stick insects will be on exhibit. This assurance population is critical to their long-term survival. The Lord Howe Island stick insect has been given a new lease on life, thanks to its rediscovery. In addition to San Diego Zoo, the stick insect eggs were flown to zoos in Bristol, U.K. and Toronto, Canada. These breeding populations will serve as insurance in case something catastrophic occurs on their tiny island, or to the group at the Melbourne Zoo. The most recent estimates indicate that there are only 20 to 30 individuals of this dramatic insect living on Ball’s Pyramid. 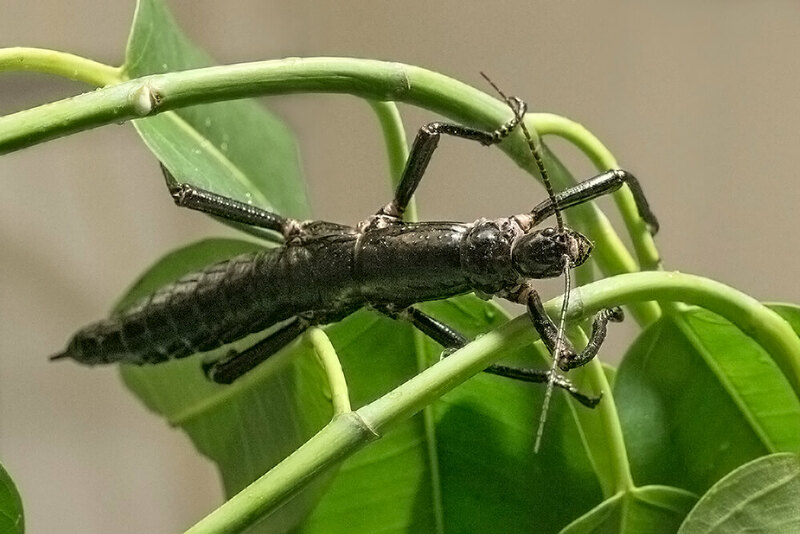 Unusual among insects, the Lord Howe Island stick insects seem to pair off, sleeping close together as “the male with three of his legs protectively over the female beside him,” as one scientist described. Nymphs that emerge from the egg are about three times the size of the egg itself. “It’s just folded up in there like an origami piece,” said Paige Howorth, curator of invertebrates at the San Diego Zoo. "Lord Howe” is not a question. But still, you might be asking yourself “how?”—against all odds—the remarkable Lord Howe Island stick insect Dryococelus australis has managed to survive.